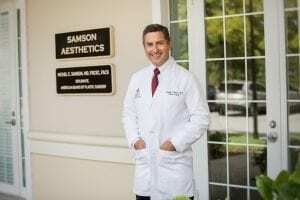 Is there a fee for a plastic surgery consultation with Dr. Samson? Dr Samson offers free consultations for patients considering cosmetic plastic surgery procedures. Dr. Samson sees most new patients on Mondays, Thursdays and Fridays. We will make every effort to accommodate patients on short notice, due to variations of the surgical schedule. I do not live in Daytona Beach. Can I still get plastic surgery from Dr. Samson? Dr. Samson’s patients travel to the Daytona Beach, Florida area for plastic surgery from other states, as well as other countries. Please visit the Fly-in Program section to learn how easy it is to make arrangements to have your plastic surgery performed by Dr. Samson. Specific arrangements can be made by calling our office. I need several types of plastic surgery. Does Dr. Samson perform several plastic surgeries at one time, or are they scheduled separately? Dr. Samson may perform several plastic surgeries at one time, depending on the procedure type and the patient’s health. This will be discussed during your consultation. Does Dr Samson perform Botox, Juvederm, Kybella and other cosmetic injectable treatments himself? Yes. Dr Samson, a Board Certified Plastic surgeon and Expert Injector, will personally perform your scheduled Botox and / or other injectable treatments in office, after consultation with you. It is very common to be concerned about the cost of plastic surgery. Each patient case is unique, so it is not possible to predict the cost of plastic surgery without a consultation. You will be given fees for your surgery at the time of your consultation. Is there a payment plan for plastic surgery? Does the payment plan cover everything or just part of the process? Dr. Samson works with CareCredit and Prosper Healthcare Lending, two premier companies in the cosmetic surgery financing industry. If you prefer to finance your plastic surgery procedures, your financing questions will be answered at the time of your consultation.